Hyundai has introduced the production version of its three-row, six/seven-seater Santa Fe SUV. The model, which debuted in LA last week, joins the two-row, five-seater version in the planned two wheelbase form lineup for the third-gen DM, and will specifically be a left-hand drive offering. The larger Santa Fe rides on a 2,799 mm wheelbase, which is 99 mm longer than the five-seater version. Its overall length of 4,904 mm is 215 mm longer, and it’s just a shade wider and taller than the two-row model. The vehicle debuts with a 3.3 litre V6 GDI engine, which is also found on the Azera. The Lambda II unit offers 290 hp at 6,400 rpm and 341 Nm at 5,200 rpm, and is mated to a six-speed auto transmission. 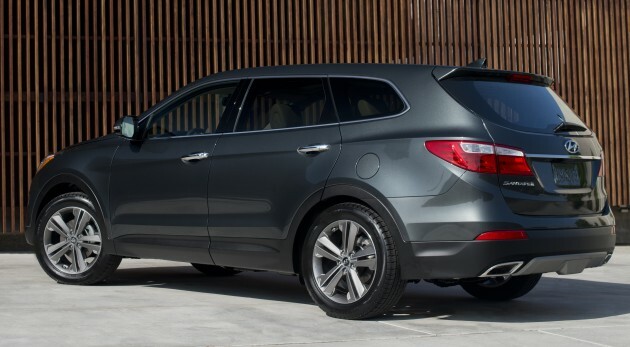 The LWB Santa Fe, available in either FWD or AWD forms, features its own bodyside character lines – compared to the five-seater – from the B-pillar back, and the main differentiating element between the two Santa Fe models is that of the side view daylight opening, or side window shape. Buyers have two options for seating configuration, these being seven-passenger seating with a 40:20:40 split-folding second row bench seat or six-passenger seating with second row captain’s chairs. Features include a panoramic sunroof, powered liftgate, an optional multifunction eight-inch touchscreen display with navigation, push-button ignition with proximity key and a heated steering wheel. 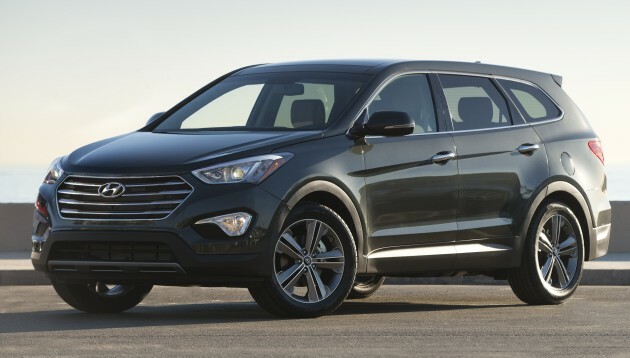 The Santa Fe sits on 18-inch Euroflange alloy wheels, with an option to go the 19-inch route. Safety kit includes seven airbags, ABS with brake assist and EBD, as well as Hillstart Assist Control (HAC), Downhill Brake Control (DBC) and Vehicle Stability Management (VSM), the last managing electronic stability control under its umbrella. Nicest thing to rakyat will be if government assist MB in lowering their prices, then nobody else dare to be very very greedy. this car is so beautiful its puts to shame the recently launched Toyota RAV4. No wonder why everybody is buying Hyundai and Kia now and Toyota is losing marketshare and facing bad RV in Malaysia. msia used car market sale statistics cant be used as a good reference bcoz msians r so narrow minded when it comes to global trends in auto industries…still stuck to the old offerings by T n H…. OMG…r u the real Sam Loo?….since u so kind to korean car… and blaming the toyota car. Why everytime when I see you, the only thing in your mind is “RV”? 290 hp at 6,400 rpm and 252 Nm at 5,200 rpm?? Are u serious with the engine? I expect 200Nm range below 4000rpm. OMG. Less torque than Preve CFE, How to run a 7seater 4WD? They should have put in better gearbox! Korean memang known for lousy drivetrain. and turbocharge it, so the torque can spread at more range. Oh my. how right! I keep forgetting that the Yanks are still in Imperial and pound foot – was more fixated in changing the inches to mm. The conversion should be 341 Nm. Corrected in the story. Thanks for the spot! But the sante fe cost less than Rm200k while the CX-9 almost Rm300k and Q7 over Rm400k. How to compare? How to compare kimchi with sushi & hitler? Mm..this design makes my mouth watered. i dont understand the hilux part, care to explain? Don’t bother him la, just another toyota junk there. Uncle Sam, haven’t you heard, Honda Brio is coming, better go book before it sold out. Don’t waste time commenting here! haiya! Bodoh pnye olang….pakai kelete 9 bln mau jual…check the market la bro…current santa fe selling like hotcakes at coty for rm131k for pre-owned units…err is that 50% off sir…plezz calculate for me…im not so good in maths maa…. That’s ok at least u can enjoy the good looking car in 2 years unlike those HV cars but super ugly and cant even look at it in a few minutes ! Not really care about the reliability,longevity and resale value but other is quite important…i don’t think those dugong whatever what ugly cars they regular make ‘ Toy , Hon or Ninja ‘ came with the good safety,driving experience or after sales service r good ! and is good to see some form of departure for that fluidic design which I personally don’t like. Hyundai’s are getting better with their designs. It’s a pity majority Malaysians think Honda’s and Toyota’s are good cars. Great design by Hyundai, but can anyone in MY put some focus on the MPVs and SUVs permitted legal load limits on our MY highways? Vehicles’s load or passengers capacity are ever increasing ( in specs) together with high tech safety features but horrible carnage is a common feature on our highways !! with whole or half a family being wipe out .Are we well trained sufficiently to drive a vehicle or car this big?? ( 7 or 8 seaters) . after graduating from a normal compact car like the hundreds we find on the road. Sorry to be a bit morbid .Over to you JPJ. The problem is not that people needs to be trained, but it is compounded by these big things hitting smaller milo tins with no safety gear to speak off. Sad to say JPJ has yet to mandate minimum safety gear and proper safety regulation. When is the last time you saw an anti-submarine bar on the rear of a semi? Where is a pickup’s front bumper in relation to your head as it t-bones your lowly wira? What is the crash worthiness of a kancil or an old Saga? Really curious to see what sort of Diesel engine they will incorporate in this new version. I hope this new one will improve the drive-train and oversensitive steering. wow Handsome car, and is good to see so i things need buy this care one. Awesome car, but again, not for Malaysia. Keep on buying those silly low spec-ed dumb Honda and Toyota. When it coming to Malaysia land….currently eyeing SUV…. Hyundai is good at copying and make their cars look good. After all, it drives like Hyundai, slightly behind the Japs cars. Sime Darby is playing to Toyota and Honda’s tune. Over priced and under spec’ed hyundais. If top of the line KIAs can offer the full complement of safety gear for less money, why can’t Hyundai? As for this 7 seat LWB …it looks far better proportioned than its smaller sibling. Maybe might find it as a minivan alternative for rental next time I’m stateside. Why do you say so about sime darby, when this car is not even launched yet in Malaysia. Why? Because every new Hyundai to date has been sold this way. Look at the prices of the Elantra and sonata, and look at their air bag count, then compare to top of the line K5 and the Forte. With the kind of prices for a Hyundai, I must as well go a rung up and consider a way better equipped and better riding Ford Focus..
Diesel is still the best for long distant travelling especially in Malaysian or in other part of the world road that has quite an up and down slopes. i think the koreans has finally moved their game upwards. is that my eye that problem or it just them are copying Ford design? Wow….! Great design – inside out! I always thought all the previous generations had great trouble getting the front-end right – totally uninviting looks. The later generations was given a really frumpy rear-end and altogether much too feminine! However, this latest version in one master stroke corrected everything that all the previous generations was not – inside out! WOW!!! LOOKS BOLD N MEAN…I LOIKEEEE!!! GO TO HELL WITH THE PATHETIC LOOKING T&H SUVs….DAH LA UGLY….OVERPRICED PLK TU!!!! Nice looking SUV and potential upgrade for my wife’s Livina. Think is better deal to buy this new SUV comparing T Estima (2008) – i gathered would around the same price range of $170k-$190k when launch in Malaysia? Korean Car comes a long way…they are slowly eating into T&H market share…The only thing I am not sure is the maintenace of this new generation cars, part availability. Nevertheless, have not heard any complaints from my friends who drives Sonata & Forte who have been driven for years (after all there was warranty of 5 years). As current owner of T, I was saddened by late poor quality which have several recalls. I was one of the batch being called for inspection and possible replacement….The QC is no longer champion in the market. My current observation on the cars on the road prompted me to take serious look on Koreans..A survey in my condo compound showing a tie of quantity of Vios Vs Forte..well it may means nothing but good point to ponder….If T&H is still so good, isn’t it should out numbered Forte ? As for RV, I am buying a vechile which I will enjoy for 6-9 years. Hence,personally I do not think much difference to T&H. Good job Hyundai and look forward the launch in Malaysia…..Heard would be on 1H 2013. Hope Anthony will share more insight soon…..
6 months later, the Estima is still worth around the same at RM170k. How do you know the future? If you know maybe you can give me the toto jackpot winning number. And who the heck changes car every 6 mths? You think changing underwear ah ? On average ppl change cars between 5-7 yrs. So in the end the RV will not be much of a difference. Life is short, so would you pay so much and suffer for 5 yrs driving an empty junk for the sake of RV? Time is priceless in which money cannot buy. Ask the old man say 80 yrs old and almost dying already, he would probably pay any amount of money just to live another 5 yrs. Funny you advice ppl to be prudent and buy a car with good RV but on the other hand you ask ppl to sell their cars in 6 mths. You must be retarded. NO car can get good RV if sold in 6 mths. You will easily lose 15-20%. Funny how the kimchi’s of this world are making better cars, some are already world class while tata came from being obscure to making sufficient profits from tata automotive sales to buy over Landrovers and Jags of this world…as M’sians, we have nothing to be proud of in Proton…I mean comparing Preve torque and Nm with a world reknown car in a Santa Fe. Two years ago, it has not been optimistic about the buy, but made him look like ah! After receiving really not disappointed, what a great, express soon, back to feeling good, next time come, the whole five minutes, Wenwen oh well, next time you touch this bag really nice. Pink color, very nice. With a light-colored, dark clothes are very nice. With the same picture. Both inside and outside the skin. Pink dirty easily send clean cream, very caring and attentive. Thanks. This package was well received. Will Hyundai Malaysia take in the Santa Fe 2.0 turbo highbird?